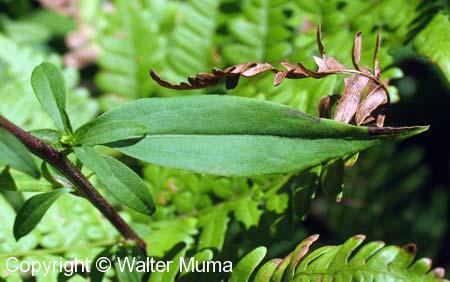 Distinctive features: Lower leaves like those of Zigzag Goldenrod. 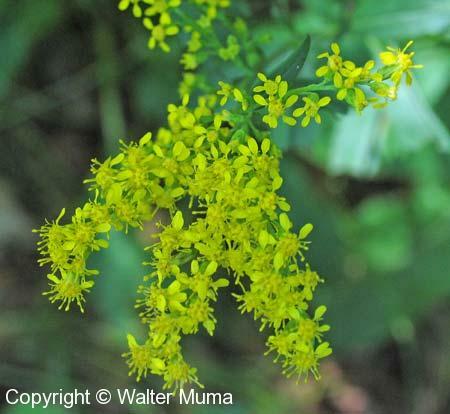 Flowers: Summer, Autumn; Yellow; Indistinguishable parts (petals); Yellow; late summer & fall. Habitat: Fields and Open Areas; Forest & field. Status: Rare and threatened - found at only a few sites in southern Ontario. 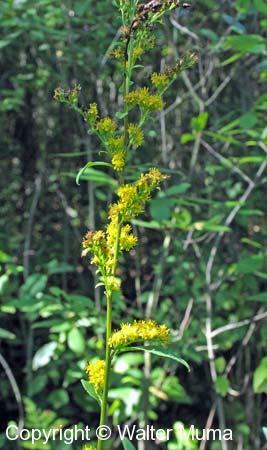 Notes: Can be confused with Zigzag Goldenrod (Solidago flexicaulis). 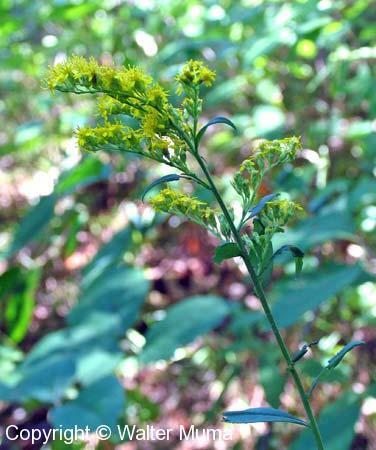 If you think you have found Sharp-leaved Goldenrod, examine it carefully to see if it in fact Zigzag Goldenrod. Photographs: 39 photographs available, of which 10 are featured on this page. SCROLL DOWN FOR PHOTOGRAPHS. Very closeup view of flowers. 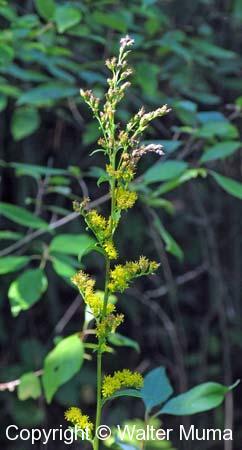 Sharp-leaved Goldenrod leaves vary a bit. 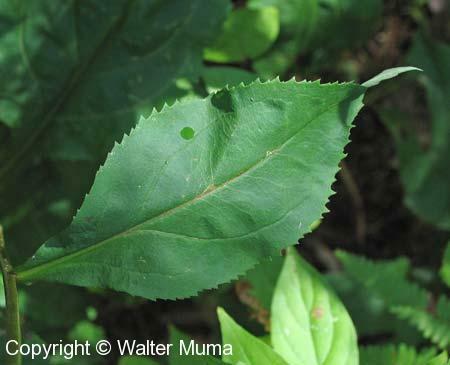 Here is the typical leaf. Note the "sharp" teeth. Slightly different leaf shape. It still has the sharp teeth. And a much narrower leaf. 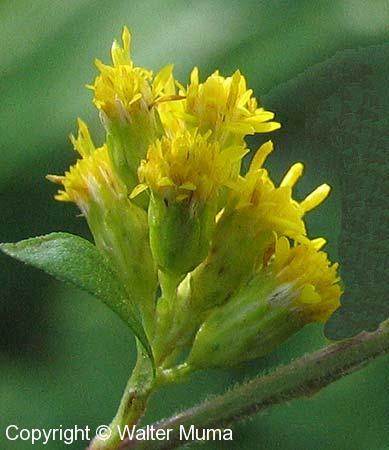 This type is found in the upper half of the plant. 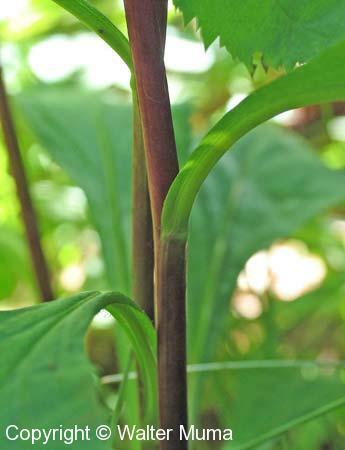 Stem showing how the leaves are attached.